Plex media server now is easy to install in Ubuntu 14.04, Ubuntu 16.04, Ubuntu 17.04, and their derivatives via Snap app. Install it either from Ubuntu Software or via snap command, and it will be updated automatically. 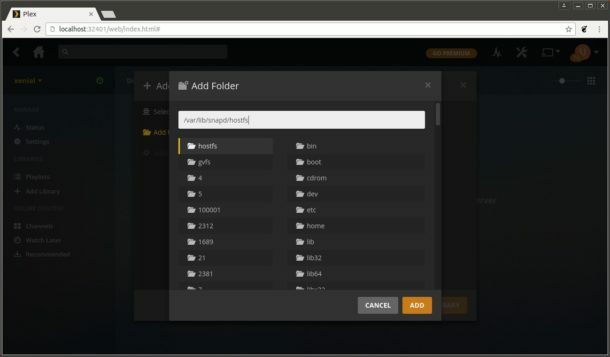 Plex organizes all of your personal media so you can easily access and enjoy it through a web UI over the network. Or install Plex apps on your favorite mobile and streaming devices, gaming consoles, or smart TVs and get access to your media wherever you are. The service starts automatically after installation with root user, so you won’t boring with the permission issue. And the “–classic” flag in the command allows the server access media files outside snap home directory. While the browser only work for snapd directory, you can simply type in path/to/media when adding your media directory.